You'll Enjoy EXTRAORDINARY VIEWS of the OPEN BAY from this IMMACULATE & RARE 4 BD, 3.5 BA Townhome with an Oversized Garage. The Open Floor Plan on the 2nd floor makes Entertaining & Relaxing with Your Family & Friends EASY & Fun! Featuring a Large Living Area with Gas Fireplace, Open Dining Area & a Chef's Kitchen w/a Pantry, Stainless Appliances & a Breakfast Bar large enough for 5 people! A FABULOUS Sunroom/Solarium and a LARGE Deck off of the Great Room are Ideal for Relaxing & Watching the Sunrise, the Boaters on the Bay & the Abundant "Wildlife" including Deer, Blue Heron & Egrets, even Eagles that inhabit the surrounding Areas ! You'll enjoy 2 Master Suites, each with a Private Bath & Walkin Closet. 1st Floor Master has a Large Sunroom & 3 rd Floor Master Bedroom includes a Sitting Area & a Dressing Area w/Separate Tub/Shower Area. There are 2 Additional Bedrooms w/Another FULL Bath making this 4 Bedroom Townhome Floor plan the MOST SPACIOUS in the Community! A Laundry Room & Oversized Garage are located on the Ground Level. You can enjoy a Beautiful Olympic sized Pool, Kiddie Pool, Tennis Courts, Basketball Courts, Exercise Room,Volleyball, Playground, Lakes & Fountains, Walking/Jogging Paths Community Piers for Fishing & Crabbing or Launching Kyacks & Canoes AND EVEN A PRIVATE BOAT RAMP for launching your Own Boat or Personal Watercraft Leading Directly to the Assawoman Bay! 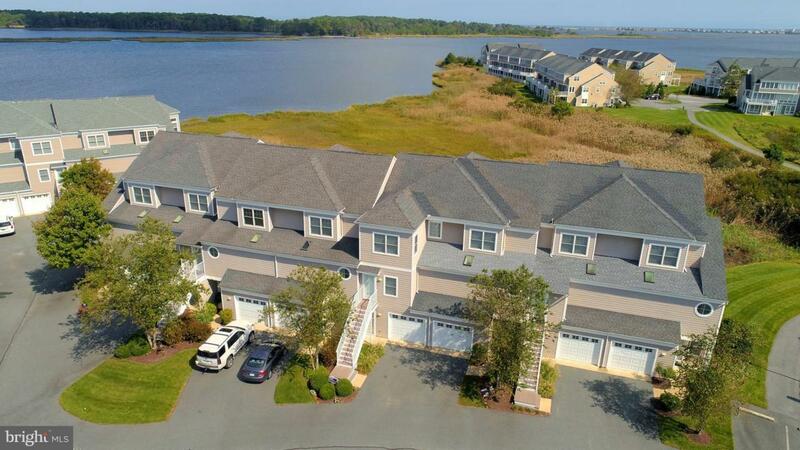 This Bayfront Community is a WONDERFUL Place for a Round Home, 2nd /Vacation Home or Rental Investment! #1215 is A DEFINITE "MUST SEE"property if You're Considering a Place at the Beach! Exclusions See Listor. List Will Be Provided.